Because there are few native speakers of English in Taiwan, students of English in Taiwan are often poorly motivated, having few opportunities to develop their skills and learn about American culture outside of class. Recent advancements in distance education allow live audio and video teleconferences via the Internet, a technology that has the potential to connect native English speakers with students learning the language. This paper presents initial findings from an ongoing pilot project in which Taiwanese students of English as a Foreign Language (EFL) interact with an American via “live” Internet teleconferencing, followed by one-on-one discussion. Quantitative and qualitative methodologies were used to evaluate changes in student motivation, confidence, and ability resulting from the presentations via the Internet. After the teleconferences, all three factors increased at a modest level, with motivation increasing most, followed by confidence, and ability. Students appreciated the American cultural information contained in the presentations and the ability to hear authentic American pronunciation and usage, and found the experience of talking with the American via the Internet to be less stressful than expected. This technique holds potential for significant increases in student motivation, confidence, and ability. Wu, W.C. & Marek, M. (2009). The Impact of Teleconferencing with Native English Speakers on English Learning by Taiwanese Students. International Journal on E-Learning, 8 (1), 107-126. Waynesville, NC USA: Association for the Advancement of Computing in Education (AACE). Retrieved April 20, 2019 from https://www.learntechlib.org/primary/p/24460/. Berelson, B. (1952). Content analysis in communication research. New York: Free Press. Bernard, R. M., Abrami, P. C., Lou, Y., Borokhovski, E., Wade, A., & Wozney, L. (2004). How does distance education compare with classroom instruction? A meta-analysis of the empirical literature. Review of Educational Research, 74(3), 379-439. Bottino, R. M. (2004). The evolution of ICT-based learning environments: Which perspectives for the school of the future? British Journal of Educational Technology, 35(5), 553-567. Canada, K., & Pringle, R. (1995). The role of gender in college classroom interactions: A social context approach. Sociology in Education, 68(3), 161-186. Clèment, R. & Kruidenier, B. G. (1985). Aptitude, attitude and motivation in second language proficiency: A test of Clèment's model. Journal of Language and Social Psychology, 4, 273-291. Cronbach, L. J. (1975). Beyond the two disciplines of scientific psychology. American Psychologist, 30, 116-127. Gardner, R. C. (1985). The attitude/motivation test battery: Technical report. London, Ontario, Canada: Department of Psychology, University of Western Ontario. Grimson, J. (2002). Re-engineering the curriculum for the 21st century. European Journal of Engineering Education, 27(1), 31–37. Horwitz, E., Horwitz, M., & Cope, J. (1986). Foreign language classroom anxiety. Modern Language Journal, 70, 125-132. Huan, T. L. (1989) Age, motivation, and second language learning. Paper presented at The Proceedings of the Sixth Conference on English Teaching and Learning in the Republic of China, Taipei, Taiwan. Hung, C. H. (1996). A study on the social interactions between the technological and vocational education and their educational milieu of English language education. Studies in English Language and Literature, 1, 82-92. Juell, P., Brekke , D., Vetter, R.J., & Wasson, J. (1996). 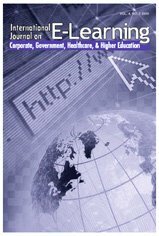 Evaluation of computer conferencing tools for conducting collaborative seminars on the Internet. International Journal of Educational Telecommunications, 2(4), 233-248. Kwon, O., Shih, Y. H., Renandya, W., & Koike, I. (2000). Opening Address. Plenary Symposium: English Education in East Asia for the 21st Century: Seeking for Common Ground, Okinawa, Japan. Labrie, N. & Clèment, R. (1986). Ethnolinguistic vitality, self-confidence and second language proficiency: An investigation. Journal of Multilingual and Multicultural Development, 7(4), 269-282. Lee, E. (2003). Learning through scaffolded assistance during interaction in the EFL classroom: The teacher's role to make an effective learning environment. Journal of Pan-Pacific Association of Applied Linguistics, 7(2), 189-213. Lescano, A. A. (1995). The remedial English project. English Teaching Forum online, 40-41. Lin, M. H. (2003, Sep. 14). Tsai Ying-Wen knows extremely well the international affairs, create a new milieu through the use of negotiation for Taiwan. Merit Times. Parker, J. E., Heitzman, S. M., Fjerstad, A. M., Babbs, L. M., & Cohen, A. D. (1995). Exploring the role of foreign language in immersion education. Highland, D., Lee, P. W., Milcham, J., Weber, R. R. (Eds.). Second language acquisition theory and pedagogy. (235-253). Mahwah, NJ: Lawrence Erlbaum Associates. Reynold, M. C., Zetlin, A. G., & Wang, M. C. (1993). 20/20 analysis: Taking a close look at the margins. Exceptional Children, 59, 294-300. Roehler, L. R., & Cantlon, D. J. (1997). Scaffolding student learning: Instructional approaches and issues. Cambridge, MA: Brookline Books. Spiegelberg, H. (1984). The phenomenological movement (3rd ed.). Hague: Martinus Nijhoff. Spolsky, B. (1989). Consider for second language learning. Oxford: Oxford University Press. Tesch, R. (1990). Qualitative research: Analysis types and software tools. New York, Philadelphia; London: The Falmer Press. Thompson, J. (1990). Hermeneutic inquiry. In L. E. Moody (Ed. ), advancing nursing science through research. Newbury Park, CA: Sage. Wen, X. (1997). Motivation and language learning with students of Chinese. Foreign Language Annals, 30(2), 235-251.